As far as hiking trails go in Eastern Massachusetts, Groton’s Gibbet Hill offers an interesting story, as well as spectacular views. Pronounced “jib-bet” and meaning ‘gallows,’ the name for the hill off Groton’s Route 40 comes from another hill in England and was named by Groton’s English settlers when they first came to the area in the 17th century. People love ghost stories, maybe even more so in years and generations past. Almost as soon the hill became known as Gibbet Hill, the stories started. Rumors swirled that hangings had been carried out on the hill. They stuck for two reasons, the first: its name – literally meaning ‘gallows hill’, and, the second: it looked like the gallows hills that the English settlers remembered from their homeland; from its vantage point high above Groton, Gibbet Hill could have been used as a spot for the town’s gallows, where criminals would be hanged, and law-abiding citizens would be reminded of the penalties for their crimes. Its name itself makes Gibbet Hill a great story, but, there’s no proof that anyone has ever been hanged at Gibbet Hill in Groton. 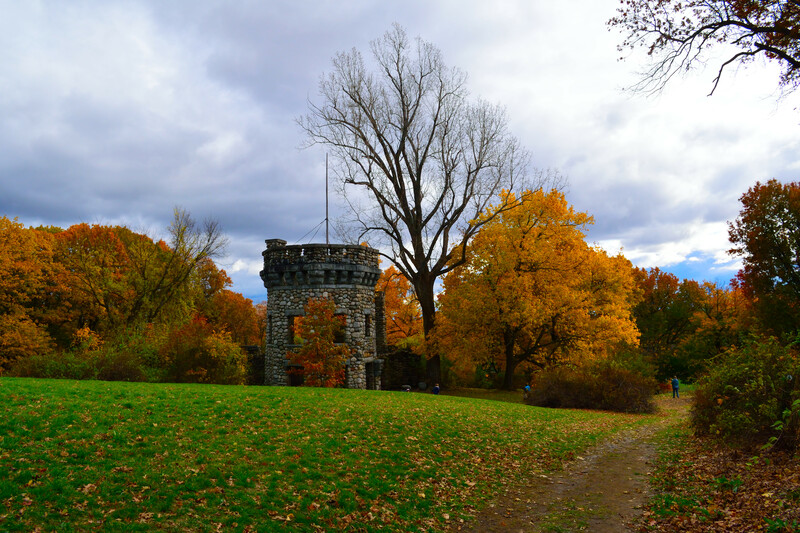 If you hike Gibbet Hill, be ready for a steep, but quick, walk to its summit, high above Groton, and you’ll be rewarded with a great view of town, and likely meet other hikers and local photographers. And, there’s also some pasture that runs alongside the trail, for those hoping to absorb some essence of the country while they’re out in Groton, which is quite bucolic for a town some 40 miles outside of Boston. Sailing down route 40 in Groton, you could easily miss Gibbet Hill. In peak season, you’d probably see it when you slow down after glimpsing a line of cars parked alongside the narrow windy road that eventually takes you into Groton Center. At any other time, though, the spot on Rte. 40 marking the entrance to Gibbet Hill is just a sandy shoulder off to the side of the road as you speed by at 40 mph. The Gibbet Hill Grill, located a quarter-mile down the road, offers parking to Hill visitors in designated spots. The trail leading upward to Gibbet Hill is steep, but well-kept and short. When you stop, though, and pass through the stone columns leading up a flat, curving trail up the hill, you’ll first see the tower. At this point, it’s easy to entertain some daydream that you’re viewing the remains of a castle, somewhere in Europe – the site of some medieval civil war or some other blood-spilling feud between rival armies. General William Bancroft had dreams. Sure, Bancroft led an accomplished life. He rose to the rank of brigadier general during the Spanish-American War, before going on to become the first president of the Boston Elevated Railroad. He even served a term as mayor of the city of Cambridge in the 1890s. But, during all that time away from Groton, his hometown, Bancroft dreamt of retiring to Gibbet Hill, where he would live out his days taking in its views, from the retirement home he would build on its summit. He would call it Shawfieldmont. He starting building the home in the early years of the 20th century, around 1906. He built the tower, and a house, but ran out of money before he got to the mansion and horse stable he had planned. He kept at it, for twelve years, when, discouraged, he sold the property to one Harold Ayers, a well-known physician who converted it into a sanatorium. Experts of the day touted the Groton Private Hospital as ‘unique’ and raved how its absolute quiet, pure air, and atmosphere of home embraced the open air treatments so popular during that era. Within the ruins of Bancroft Castle, you'll see the double hearth fireplace. Ayers called his sanatorium the Groton Private Hospital, where, for $20 a week, sick, rich people could take in the spectacular views while they languished through ailments such as TB, or what the 1920s called insanity. The sanatorium too, met an early end. By the dawn of the 30s, it too was gone, and the property was used by the Groton Hunt Club for dances, social events, and to host fox hunts. From Groton's Gibbet Hill – A view of Mt. Wachusett, 30 miles away. And that too met an inauspicious end, when some trespassers got careless with a few firecrackers during their jaunt onto the property one 4th of July in 1930. The spark caught life and the entire structure came down. It was never rebuilt. Today, only the stone ruins remain. These days, the estate lies on conservation land, and anyone can visit the ruins of the Castle. The paths up to the castle, and around the top of the hill are well-kept, and there’s ample opportunity to wander within the ruins of the castle, and inspect its tower, great double hearth, and stone walls – when you’re not taking in the breathtaking views, of Groton, Mt. Wachusett, and, on really clear days, the White Mountains of New Hampshire. And, as far as the ghost stories? The locals still tell the tales of Gibbet Hill hauntings they’ve heard about over the years. There are stories of disembodied limbs spotting while peering through the castle’s windows, or ghosts of colonial vintage roaming the property. But, unless you’re crazy enough to venture up onto Gibbet Hill after dark, the truth about those stories is likely to remain a mystery.